The Great Western Auctions Ltd. was established in 1989 in Glasgow by Anita Manning and her daughter Lala Manning. In doing so, Anita became one of Scotland’s first female auctioneers. Our first premises were in the heart of the West End of Glasgow with a staff of 3 (including Anita and Lala). We have since moved twice to accommodate the growing business. Our present staff of 15 dedicated specialists and auction administrators ensures the highest standard of service for our clients. Great Western Auctions attracts consignments from all areas in the UK and our valuers are delighted to visit your property for valuation purposes. Our programme includes fortnightly Antiques and Collectables Auctions, Quarterly Fine Arts and Antiques Auctions and a variety of Specialist Auctions throughout the year. At Great Western Auctions we hope to combine the traditional values of integrity, personal service and expertise with the latest technology. Our large private client base built up over 25 years and the worldwide exposure of our sales on the internet ensures fierce competition for our lots. Anita and the staff have been delighted to help in fund raising for many charities including Children in Need, Marie Curie, CHAS, CLIC Sargent, Combat Stress, Poppy Scotland, Help for Heroes and many others. 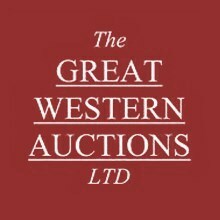 Great Western Auctions has taken part in many BBC Antiques programmes including Flog It, Bargain Hunt and Cash in the Attic. Over the last 25 years Great Western Auctions has become one of the leading independent Auction houses in the UK and we look forward to a future of continuing growth and outstanding service to our clients.